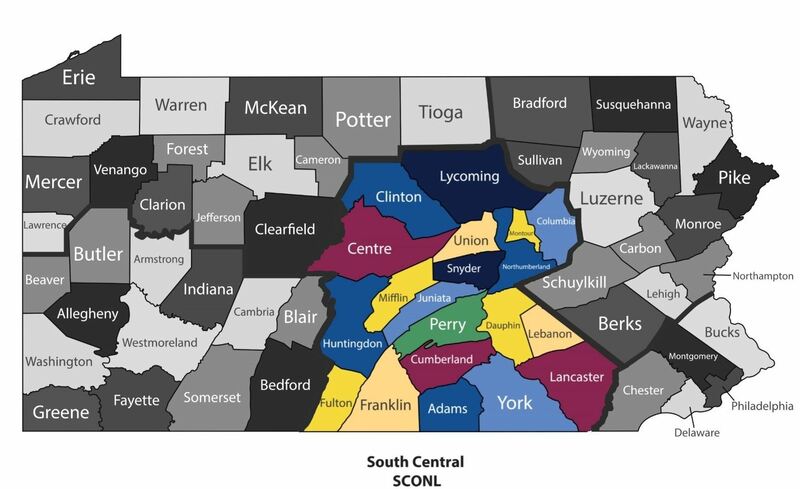 The South Central region of PONL is noted for their large Amish and Mennonite populations in its rural areas, but they also have significant African American and Puerto Rican populations in many of its urban cities, particularly York, Harrisburg, Lancaster, Lebanon, and Reading. Between 1700-1950, the area was historically settled by ethnic German, Dutch, Italian, Irish, and English populations. The area is home to the Pennsylvania state capital, being the site of the bloodiest battlefield of the Civil War, as well as the home of Hershey's chocolate and the York Peppermint Pattie. South Central Pennsylvania has also hosted two former capitals of the Unites States during the American Revolution: Lancaster and York. The region is drained primarily be the Susquehanna River, flowing southwards to Chesapeake Bay and further to the Atlantic Ocean. Counties represented in this region are: York, Dauphin, Cumberland, Lebanon, Lancaster, Perry, Franklin, Huntingdon, Mifflin, Juniata, Adams, Fulton, Berks, Schuylkill and North Cumberland. To foster nursing leadership to advance the profession, achieve excellence in healthcare delivery and provide leadership in shaping health care policy. SCONL serves its members by providing leadership, professional development, advocacy, and research to advance nursing practice and patient care, and promotes nursing leadership excellence. SCONL is a strong advocate for the Nightingale Ceremony held each year in the Harrisburg Area, with many of our SCONL members participating on the various committees to bring this event together for the state. "Nursing Leadership in Non-Traditional Roles"
Julie Deel, MSN, BSN, RN-BC, Kathleen Law MS, BSN, RN, CNOR, and Ann Kunkel, BSN, RN. This program is eligible for 3 CEs. All non-nursing staff will also receive a CE certificate for their records. Review the full agenda and objectives. Register via email to Andrea Potteiger.